We are experiencing the most intense global dust storm on Mars since 2001. The Opportunity Rover in Arabia Terra has paused operations as there is not enough sunlight reaching its solar panels to recharge the batteries. On Curiosity, the plutonium radioisotope power source means that we can keep working. However, our views of Mt. Sharp are obscured by dust. On the HiRISE and CaSSIS orbiting cameras, which we are using to select and characterise future landing sites, we may not be able to take useful images until for a few months. Currently it is between Mars’ southern hemisphere spring equinox and summer solstice. That means more solar radiation is reaching the southern polar ice cap, which is composed of a thin layer of CO2 overlying H2O. As the ice sublimes, the atmospheric thickness increases slightly and so can hold more dust. However, dust storms are unpredictable so we arent sure when the dust will clear. The image shows a Hubble Space telescope image before and after the global dust storm of 2001. 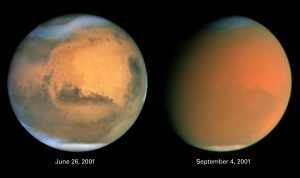 Hubble Space telescope image of 2001 global dust storm, similar to the conditions Mars is experiencing at the moment.